Canvas is here - join us! Now in the 3rd week of spring, we have 1565 courses created, and 94% are published (1771). You can create your course sites for spring term now with our self-service request form. Please don’t hesitate to contact us if you need any assistance finishing up your course site: canvas@uchicago.edu. At the end of winter quarter, we had 1618 courses created in Canvas, and of those, 95% (1533) have been published. 1628 instructors were using Canvas with a total of 14,474 students. At the end of autumn quarter, we had 1530 courses created in Canvas, and of those, 94% (1440) have been published. 1599 instructors were using Canvas with a total of 15,218 students. At the end of summer quarter, we have 253 courses created in Canvas, and of those, 95% (241) have been published. 298 instructors were using Canvas with a total of 7,344 students. Towards end of winter quarter, we have 1512 courses created in Canvas, and of those, 93% (1404) have been published. 1492 instructors were using Canvas with a total of 13,520 students. Towards end of winter quarter, we have 1478 courses created in Canvas, and of those, 94% (1392) have been published. 1473 instructors were using Canvas with a total of 13,992 students. As of the end of autumn quarter, we have over 100% of expected course sites created in Canvas (1508), and of those, 92.5% (1394) have been published. 1450 instructors were using Canvas with a total of 14,764 students. Since we began our official transition to Canvas in autumn 2016, we have come a long way! 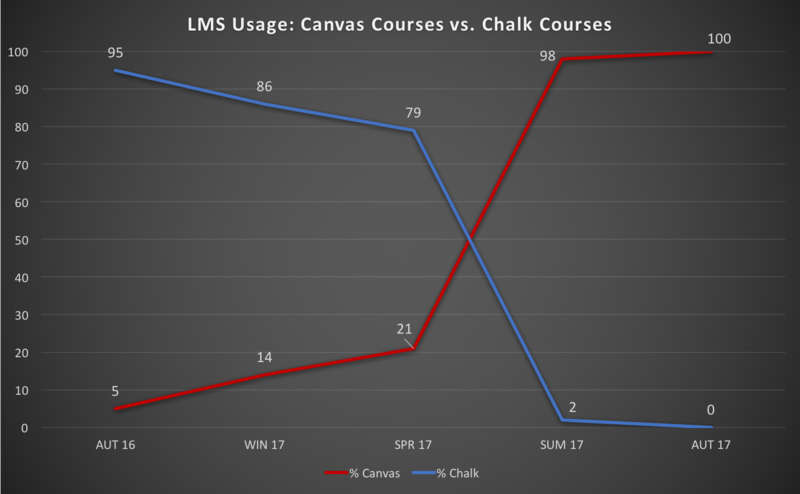 The graph above shows the percentage of all courses using an LMS taught in each system per quarter. By spring 2017, we had 21% of all courses taught in Canvas between our early adopter units and faculty who proactively chose to start teaching with Canvas. Summer 2017 marks our first quarter where all for-credit courses must be taught in Canvas, and the number of courses created in Canvas exceeded the number of courses in Chalk for summer 2016. For more information about how we chose Canvas as our next learning management system, you can read about it on the project background page.